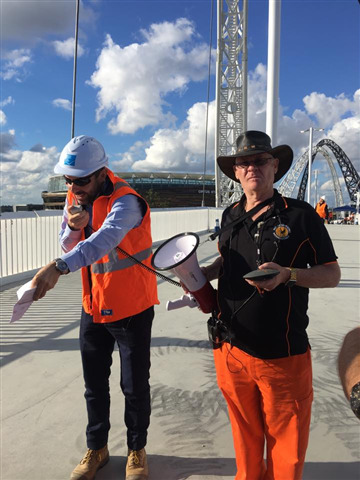 The SES Volunteers Association was asked to be involved in the testing of the new Matagarup Footbridge Bridge connecting East Perth to the Stadium area in Burswood. 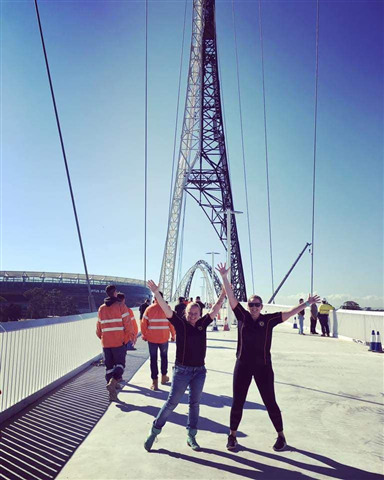 As a result of the large movement in the Millennium Bridge in London, the Italian builders of the Matagarup Footbridge Bridge requested fifty SES Volunteers to run and jump in a special sequence that would be synchronised. The day started off with the SES Volunteers being addressed by Charlie WilsonClark, a Manager from the SRPB Alliance, on what the day would entail, the Engineers about the Bridge and Ilario Spagnolo, the Main Roads Project Director, thanking the SES Volunteers for their involvement. 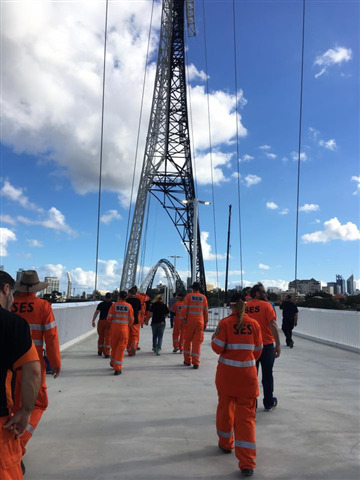 The SES Volunteers did a walk over the bridge first to familiarise themselves before getting into the business part of the day. Sensors were placed in predetermined locations on the bridge to enable a team of engineers to monitor bridge behaviour as the SES Volunteers jumped, walked and ran in a predetermined and synchronised manner. The movement of the bridge could be easily felt at times and as the engineers adjusted the movement damping devices, the decrease in bridge movement became obvious. The wave motion of the bridge could be felt quite strongly as the fifty Volunteers jumped from side to side. This equated to a weight in excess of 3000 kgs landing left then right at 2 second, 1 second, twice a second, and four times a second interval. The Volunteers covered more than 7.5 kms in their running, jumping and walking of the bridge. The SRPB Alliance provided a what appeared to be an “all you can eat” lunch at the Camfield Restaurant. It was a day enjoyed by all and very different to the routine searches and rescues performed by SES Volunteers. There are many videos on the SESVA Facebook page which show the Channel Nine news report, Main Roads drone video and many pictures taken by the Volunteers on the day.